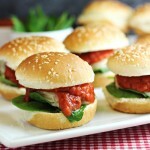 This Chicken Parmesan Sliders recipe creates fun, mini sandwiches with lots of flavor! The chicken patties are cooked in the oven making them easy to prepare. Perfect for game day or parties, but also fun for a family dinner. Spray a baking sheet with cooking spray. Preheat oven to 350 degrees F.
In a bowl, mix together chicken, 1/2 cup marinara sauce, Italian seasoning, garlic powder, Parmesan, red pepper flakes, salt, and pepper. The mixture will be very moist. Scoop about 1/4 cup of the chicken mixture (about 2 ounces) and form into small patties. If necessary, wet hands a bit to help in forming the patties. Place each patty on a baking sheet. Bake for 8 minutes, then remove pan and turn patties over. Continue baking for another 8 minutes. Remove pan from oven. Place 2 cheese quarters on top of each patty. Return to oven and heat until cheese is melted. Take a slider bun and place several spinach leaves on top of the bottom portion of the bun. Place a patty on top of the spinach leaves. Add a spoonful of marinara sauce and place the top of bun on top. Repeat with remaining buns and patties. Serve and enjoy! –Shredded mozzarella cheese can be substituted for slices; you will want about 4-6 ounces of cheese.